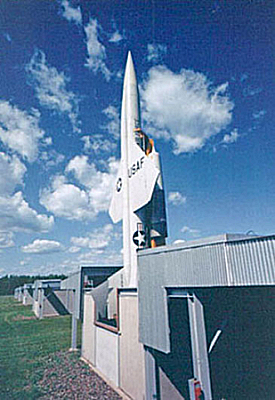 U.S. Air Force BOMARC nuclear antiaircraft missile at launch facility in French River, Minnesota, approximately 12 miles northeast of downtown Duluth, 1967. Photograph courtesy of National Atomic Museum. An Air Force Magazine article on that service's nuclear air defense weapons can be found here. C-SPAN's American History TV coverage of Christopher Bright's remarks at the Eisenhower Library can be found here. To read a Cape Cod Times account of BOMARC missiles in Massachusetts, click here. For an article about BOMARC missiles on New York's Long Island, click here. For a 2008 Colorado Public Radio interview on the North American Aerospace Defense Command (NORAD) and early continental defense preparations in the United States, click here. For a Chicago NBC5 television news story about Nike-Hercules deployment in the Windy City, click here. For a Bill Arkin article on WashingtonPost.com about Mr. Bright�s research, click here (pdf).